Christ knew that I needed to admit that I was paralyzed. I had to admit that I was absolutely stuck. I was unable to get over my addiction by my own efforts. I was unable to get a new way of living; I was unable to defeat all the root causes of my addiction and insecurity. The only way I was going to be able to get free was to let some people carry me to Jesus. He had to heal me, then it would be up to me to get up and walk out my healing. Some of you are paralyzed and need to admit it. You might be paralyzed with an addiction like I was. You might be paralyzed by fear. You might be paralyzed by guilt, or worry, or insecurity, or any number of things. Search your hearts, and let Christ stop you in your tracks like He did for me. Put your name into the verse the way I did and realize that you are paralyzed, but you don’t have to stay that way! Christ WANTS to heal you. 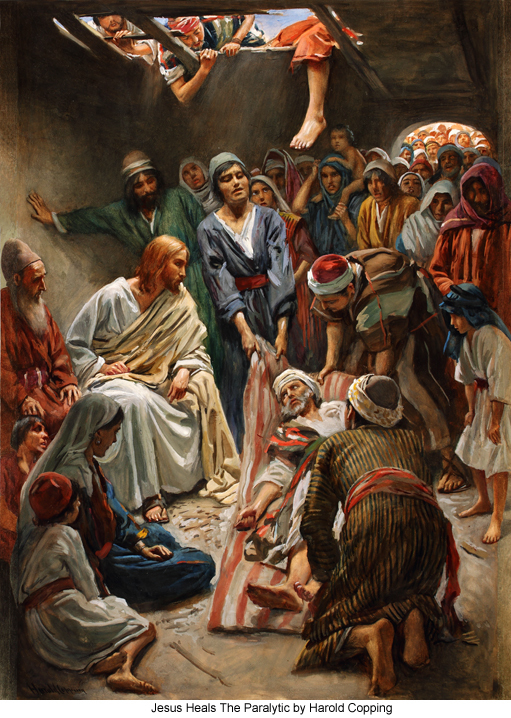 Like with the paralyzed man in this story, He wants to let you know that you are forgiven, (Friend, your sins are forgiven) and he wants to set you free. Good chance you might need friends like the paralyzed man did to bring you to Jesus. I found those friends in my close friends, some of you guys, and my Overcomer’s in Christ group at church. When we are sick, Christ longs to restore us. But we have to let Him.